It is a crushing machine that takes advantage of the impact energy to crush stuff. 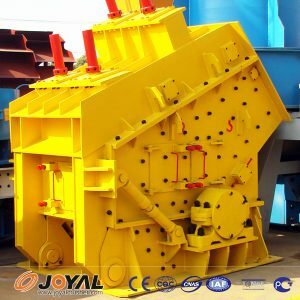 When the stuff enters the body of the machine, it is impacted by the hammers, thrown onto the impact plate, and crushed. The stuff springs from the impact plate is impacted by the hammers again, and thrown onto impact plate. This process will last until the stuff meets the requirement and falls from the machine. Adjusting the distance between impact frame and rotor frame can change the shape and size of the output. When some stuff that cannot be crushed enters the machine, the impact frame will fallback, the stuff falls from the machine. This device can guarantee the machine cannot be damaged. PF-series Impact Crusher mainly consists of rotor, impact frame, mainframe, ratchet cover and rotation parts. The rotor frame is welded by steel plate. The hammers are fixed on the rotor. Lateral stop can effectively avoid the movement of the hammers. The hammers are made of abrasion-resistant material. The whole rotor has good balance and resists impact. The mainframe consists of seat, box-frame, and back cover, which are jointed by special bolts. The back cover adopt ratchet device, it is safe when the worker replaces the easily damage parts. It is more convenience to examine, repair the machine and replace the easily damage parts if the user equipment hoist over the mainframe. There are two repair doors on the two sides of the mainframe. In this type machine there are two impact frames —front impact frame and back impact frame. Each impact frame is separately suspended in the mainframe. When the machine is running, the impact frames keep the normal position by the gravity. When something that cannot be crushed enters into the machine, the impact frame will rise up, discharge the material, and come back. The distance between impact frame and rotor can be adjusted by the bolts. The impact plates can be replaced from the serious abrasion place to the less abrasion place. The rotor is droved by SPC V-belt. The belt wheel joints the rotor with motor, it is easy to install and uninstall. There are two ratchet covers in the both sides of the mainframe. It is easy to open and close.